First Two Kiwi Coast 'Kiwi Live Here' Roadside Billboards Up! You are here: Home / Kiwi Coast News / First Two Kiwi Coast ‘Kiwi Live Here’ Roadside Billboards Up! Visitors take note – kiwi roam free in Northland and good dog control is essential for their survival. 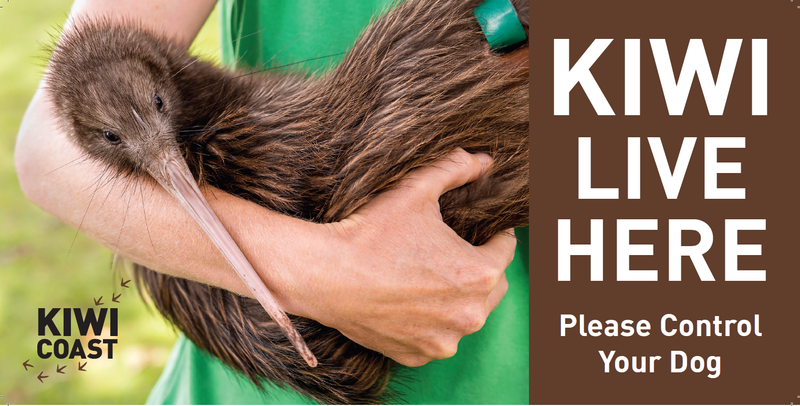 This message is being promoted by the Kiwi Coast Trust over summer with a series of new roadside billboards. 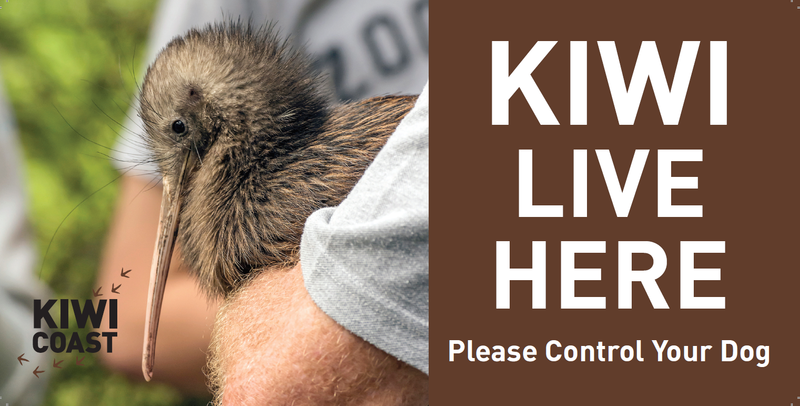 The billboards back up the work of over 120 groups and projects throughout Northland working hard to ensure kiwi can thrive and roam safely in the region. The first two ‘Kiwi Live Here’ signs are now up on Ngunguru Road and State Highway 1 near Hikurangi. Both billboards remind visitors to Northland that kiwi are present and dogs need to be controlled. Northland brown kiwi should have a life expectancy of 50-65 years. In Northland, the average lifespan of kiwi has been reduced to 14 years due to kiwi being killed by dogs. Kiwi Coast takes a positive approach to encourage dog owners to control their dogs and ensure they are not free to wander. Kiwi Coast, photographer Malcolm Pullman and the Department of Conservation (DOC) worked together to replace the old ‘Any Dog Can Kill Kiwi’ billboards which had seen better days. The billboards each feature a stunning kiwi image captured by Mr Pullman. Roha the kiwi, released by the Pukenui Western Hills Forest Trust graces the Ngunguru billboard while Kokiri the kiwi, released by the Tutukaka Landcare Coalition features on the Hikurangi billboard. Further ‘Kiwi Live Here’ billboards have been requested for Russell, Mangamuka and the Bay of Islands.